Today I look around and my breath catches in my throat. Surely I should take off my shoes. Or fall to my knees. Or raise up my hands. Surely this moment is holy. Not because of anything spectacular. This morning is going the same way every morning goes. Still in my pajamas, hair disheveled, placing porridge dishes in the sink before grabbing another cup of coffee, I look around. Regina moves into place beside me to help scrub the dishes. All four of her once-malnourished children play in the yard in front of us, strong and healthy. We both look out the window at them and look at each other and smile and don’t say a word. As we look back out the window, Makerere walks by, not limping, raking the leaves in our back yard. He looks up and he smiles and I think of whole months when he didn’t smile and whole months when he just couldn’t leave his alcohol addiction and whole months when I could see his leg bone. Some days, babies die and children don’t obey. Some days, friends won’t leave their addictions or take the ARVs that could save their lives or listen when I try to share the gospel. Some days the hurt of the world muddles my vision and I forget to remember that every moment is holy and I could live here on my knees with shoes off and hands raised if I would just choose to see it. Tomorrow or next week or in ten minutes I will forget. A devastated friend will sit on the couch and I will struggle to find words that encourage. I will cry as I peel carrots over the open, already-stained pages of Psalms. But right now I breathe deep and bend knees and raise hands high. And I say it to you and I say it to me: God has been good to us. And to Him, the Good Father, I say thank You. YES! His grace is beautiful! YES! His grace is radiate! Loving you from California and thanking the Sweet Lord in heaven for all he is doing! God bless you! first comment of many, i am sure sweet Katie. This was such a blessing to me. We pray for you often, always giving thanks to the father for you and his work through you. getting our little home ready for the birth of a new school year, we placed your picture, big smile, with children all around you, on our world map; reminding us to pray for your work. Just Beautiful.... I want to grow in seeing the Holy moments...ones that I miss because I have not tuned my heart to give thanks in all things...the good and hard things....the big and small things. Your heart is just such a wonderful encouragement. As a 42 year old mum of three I have to say, I want to be like you when I grow up. Your tender heart continues to remind me of what it is really all about. I am praying for you, your girls, your ministry and that hearts will be changed through your book. God really has been so good to us. God truly is good. I am feeling the same way today as our family enjoys our last few days in America before we head back to Ethiopia. Thanks for sharing this. This is beautiful. Thanksgiving is Holy! I love your blog, Katie! I'm a friend of Kristi Williams and I know you guys get to see each other sometimes. I pray for both of you as you work and serve and love for the Lord. I just wanted to tell you that. You don't know me. But I am grateful for your story. Thanks for the reminder that God is at work every moment. Keep fighting the good fight. You're in my prayers. Beautiful. Happy. Healthy faces. Thank-you for fulfilling His call on your life! God has been good to us..thank you for reminding me Katie.. in this busy world, in this busy days, when being inconvenient for the comfort of other people is really hard work and uncomfortable, still reading of your life and your love for God gives me no reason to give up. God has been good to us too.I Thank God for your life. God bless the works of your hands. You're absolutely amazing. Thank you for pointing us all to God's glory, and for being human with us, and failing and turning back over and over. Thanks for everything I can't even put into words. Indeed. God has been good to us. God is so good. Thanks for the encouragement and reminder. Wow! You are so amazing! I love you, Katie Davis! thank you for sharing your heart. i am inspired and encourage...and praying for your precious family. Lovely -- so many blessings! God is good to us and I am so glad you can see how good He is in your life too. I hope that comfort and sweet peace that the Holy Spirit brings fills your heart and your home every hour of every day! yes, God has been good to us! He is worthy to be praised! :) Your life is such a strong light!! Shine sister, Shine!! Sending you love. Wanted you to know that there's a little Jesus-following mama of three in New Hampshire, USA, who is following your journey and has just prayed that God would surprise you today in a tremendous way. Beautiful. How often does the Bible tell us to listen...hear...see...remember - because we so often forget His goodness. Thank you for this sweet reminder. Yes he has. Thank you for sharing your story with us. We must tell our stories - THE story. And we must hear it from others. You encourage! I was led to your blog after NPR did a piece on you a few weeks ago. Your words are such a great encouragement to me- not just because of the amazing path the Lord continues to lead you on, but because of your humility, honesty, and desire that He would become more as you become less. I will be praying that as the world turns to your little corner, that they would see the one who holds all things together. I keep reading these blogs each time you post and I think to have the faith you have would be amazing. But I also figure that it did not come easily and that it's been a long hard road to get that kind of faith. I thank you for posting these and showing that there are people especially women out there with morals and good faith. Love reading your blogs! Look forward to new ones. I read your entire blog in 3 days, and I'm hungry for more. Yes, God is good to us. 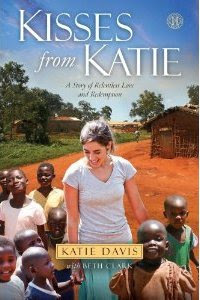 Katie-you truly are one of the most amazing people I have ever come across hearing about. Thank you for your words. You paint an incredible picture of Truth and Grace. God is so good-all the time. I wish I could describe how reading about your life and your family makes me want to do something so much greater with my life. Thank you for following God's plan for your life. He will continue to be good to you. for they will see God." As I follow your blog, I feel ashamed that I complain about my struggles. I'm truly humbled by your obedience to Him. God Bless you and keep you! Amen. Thank you for another wonder post Katie. We do forget don't we. Still praying for you, your ministry and your children. Blessings! That is wonderful! 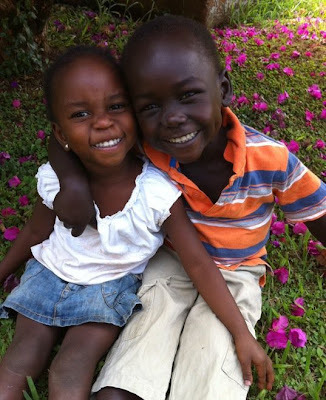 Thank you for your encouraging, ministry-minded blog...and for all you are doing in Uganda! beautiful.love how He restores, beyond our wildest dreams. wish i could be there to hear you speak in october...but will be praying for you, and praying for your daugthers when you travel. grateful for you and this little part of the kingdom you are building up...He is glorified. So, so true. We all need to see all of the things we need to be thankful for. What can I thank God for right now, even though life may get tough again in 5 minutes? Oh, thank you Katie for the reminder to constantly be aware of Gods goodness and his holiness. How often I forget. As always, you bless me! All there is to say to this type of worship and humility is amen. I am 25 and live in SE Asia where I have come to reach to the broken. I've followed your blog for a while now, and through my experiences with broken children, I can weep with you. I relate to days of wondering where God is or being nervous and feel unfilled. This year has been a process of learning to go before Jesus in worship and receive from him, and He takes the burdens away. You are further down the road in your work, but I want to say, thank you, for inspiring me. Great job at catalyst today. Way to go! Amen- what we all need to remember. Oh be still my heart!! I just finished your book. Thank you. I do and will continue to pray for you to our Father in Heaven. This is beautiful. The ability to see the goodness of God through every situation is such a gift. Never lose sight of that. Your love is amazing, over flowing and blessing those around you, never lose sight of that. You are loved by an amazing God who will provide for you as you continue to serve Him. Never lose sight of that. Sometimes we forget, sometimes we remember, and sometimes we remember that we're always happier when we do recall! My sister made up a saying that I'd like to tell you. Maybe, someday, you can use it, I don't know, but maybe. "Have hope, for sometimes it is all we have. Have faith, for without God we have no hope." I suppose it is just a simple way of saying, "Have God." Wow. Lots of good stuff throughout, but the whole Church needs to remember this. If we did, the world would look VERY different. I wonder why this one has comparatively few comments. Interesting. May God bless you-- and all of us-- beyond all you have dared hope for.